This chapter and the one which follows are, even more usual, an overview of considerations - they do not give details! In the whole area of finance, expert advice is normally essential. You should study the relevant material which is developed in Bott, Coleman, Eaton & Rowland , or similar textbooks, which go into greater detail. One of the reasons for continuing to recommend this as a specified textbook is the clarity of its description of financial issues - a clarity which has been much praised by former generations of TBS accounting specialists! Over this chapter and the next we look in turn at these five areas. It is very easy to appreciate that there are costs associated with any particular activity. Forming a basis on which to calculate or even estimate these is not always so easy. The accountants try to make things easier by identifying a number of different areas. These too are not quite as obvious as they appear at first sight! Indeed, they're quite tricky and far removed form the simple thought that the cost of getting a computer is what you have to pay for it when you go into the shop. The difficulty is that the computer, indeed any piece of equipment, retains a value (a varying value, as time passes) and we have to find a way of coping with that. The costs of any piece of equipment naturally falls into two distinct parts, one fixed, one variable. although it disguises two potential complications. Firstly, it may be necessary to spread this cost over a period of time. Secondly, we mightn't actually be in a position to say what the value of the piece of equipment is going to be at the end of its period of service. We can get round both these consideration by considering the idea of "depreciation", where we apply some sort of formula to calculate a drop in value over a period of time. There are two standard ways of doing this, straight line and variable depreciation ("variable" here is a title, the name of a pattern of depreciation ... we have not yet got to the issues of the variable equipment costs). The straight line graph shows an item being depreciated uniformly over a period of twelve years (meaning that after four year it has reduced to two-thirds of its initial value) and might be appropriate for something like a set of furnishings. 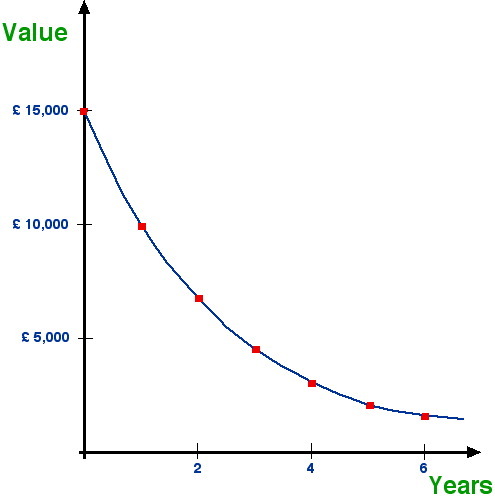 The variable graph shows a depreciating balance calculation, where the item loses each year a third of its value at the start of the year; it might be appropriate for a motor vehicle, maybe even for a small computer network. The most obvious examples of a variable equipment cost concern vehicles, in particular cars: the annual sums required for servicing, or the purchase of replacement tyres, are both dependent on the mileage driven. Similar things occur in computing, but they tend to be regarded in other categories of costing rather than as an equipment cost; for example, the annual cost of software licences (which varies with the requirements of the time) or - at least in a pre-broad band world - of net access. Note that it may (sometimes will) be necessary to include also the "opportunity cost" of the equipment, described at the end of this costing section. For example, floppy discs or, these days, CDs, and printing supplies. ...which may vary with vendor and maybe with time. Here is a clear instance where the need to keep financial records suggests quite strongly how we should be operating, in this case how we should handle our stock: perhaps on a FIFO basis (see material in 'Programming Techniques' class! ), by forming our stock into a queue? But in addition to all the immediate costs of some particular project, there is a variety of general costs which need to be shared over all the projects, costs to be divided between several project costings on some defined basis. These are, if you like, the indirect costs experienced by the company just by virtue of its existence. all a company's overheads must be covered somehow! But there is one other aspect of costing still to be mentioned ... "Opportunity Cost"
if you don't, then you will have to pay interest on the sum borrowed. Thus you can thus easily evaluate whether or not a particular project or an equipment purchase represents a worthwhile financial strategy, by comparing the opportunity cost with the expected return. Opportunity costs, though, are only relevant in special circumstances, when you are really keen to be able to evaluate an option. Always remember that they are not the only consideration. A typical home PC costs perhaps £500. 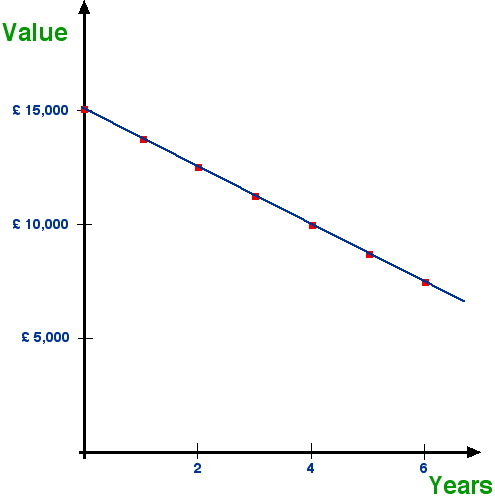 Equivalent at 2008 prices to an interest cost of some £25 per annum (that is, £25 each year). But if you actually want that computer the thought of the opportunity cost is unlikely to seem very relevant! ... all of which is tricky! and in addition we may need or wish to plan for the maintenance and development of work already completed. How important is it to win that order? As a way of keeping the team together meanwhile? Possibly even as a loss leader, aiming for other work? ... which leads us on, to investment assessment. So, now we can prepare a budget! And, if we have sufficient money to meet it, all is well. which brings us to the ideas of "cash flow analysis". Essentially cash flow analysis is a neat trick ... a way of showing we can do something at less net cost than we'd thought! Which is potentially dodgy, but usually necessary! ... which is just another way of saying that the working capital required for a year of student life is less than the total cost of that year. The working capital for a period is the sum of money we MUST have access to! Obviously this makes most sense (or, if you like, the need for working capital is potentially reduced) when dealing with a range of products. ... the idea of discounted cash flow. ... Remember the equipment-related idea of "opportunity cost"? ... and the "pay back period", the period until we move into surplus. ... and, in particular, to choose between differing possibilities of product development. ... but at a profit! We have been talking about financial as opposed to technical (Computer Science) considerations. But do remember other kinds of considerations also apply! Similarly in the 1980's the then Soviet government encased Chernobyl's nuclear reactor in concrete (too late!) to prevent further risk to human life. It is unlikely that we as computer scientists will have to face environmental issues on this sort of scale (the problems associated with microchip production are probably as close as we would normally expect to get), but there are related ethical issues, such as being involved in work for socially undesirable projects. Think for a moment: there are plenty of possible examples! The point is, to note that not always are our judgements driven by financial or even technical requirements!